God has given the Church His blueprint for building itself up which includes relating to one another in specific ways and everybody doing their part through the use of their spiritual gifts. 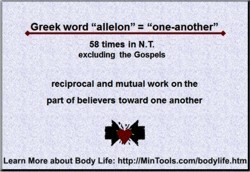 The Greek word for "one another" is "allelon" which denotes a reciprocal and mutual work on the part of believers toward one another. It occurs 58 times in the New Testament, excluding the Gospels. These results of true body life fuel an anticipation. People actually look forward to coming together. It becomes a priority in their lives. These results also provide a platform for evangelism. In a high-tech, low-touch world, people take notice when a group of people exhibit such loving relationships. It helps to produce a yearning within them for the same. We are used by God to demonstrate Christ's love and grace in action.